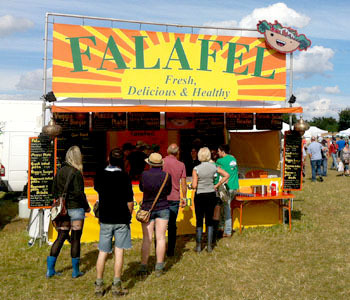 Vegeteria are a family owned vegan and vegetarian festival and event catering business who specialise in freshly prepared mediterranean food. Our menu consists of several nutritious products that combine to make a delicious healthy fast food. Our signature dish is our handmade Falafel. 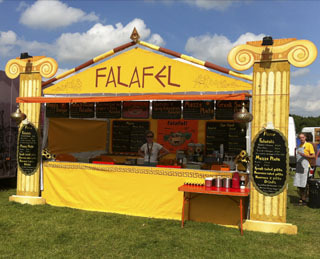 Each sandwich is packed full of tasty ingredients and made to order using a large pitta bread filled with freshly cooked organic Falafel balls, home-made houmous and a variety of delicious salads and sauces. Our menu and stalls are designed to offer a clean, friendly and fun approach to vegetarian food and provide exciting twists on classic Mediterranean dishes. Fully compliant with UK Gas, Electrical and Health and safety regulations.